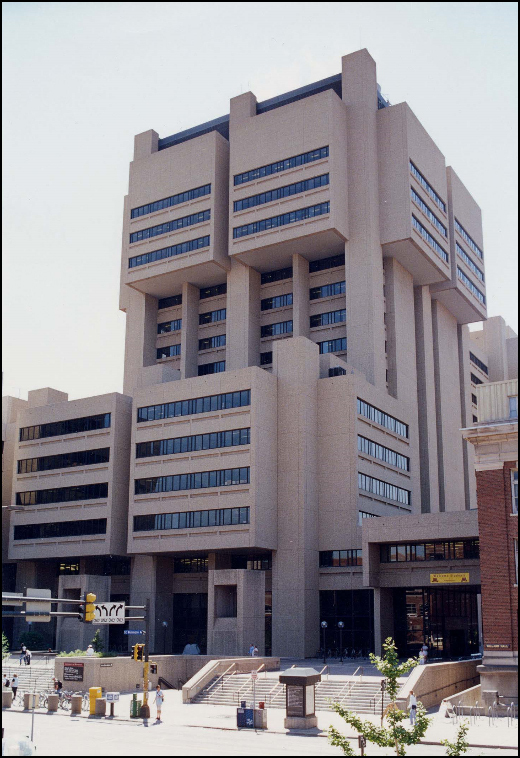 That is how some referred to the Health Science Unit A shortly after it was completed in 1971, now officially named the Malcolm Moos Health Sciences Tower. The reference was to the then dean of the School of Dentistry, Erwin Schaffer. The school and dental clinics are one of the primary occupants of the structure. I have heard others refer to the building as ugly, dark, oppressive, and Orwellian. But the most apt derogatory term would be brutal. Moos Tower, Weaver-Densford Hall and the Phillips-Wangensteen Building, which comprise the majority of the health sciences complex expansion during the 1970s, are all examples of Brutalism in architecture. The designation of Brutalism is actually derived from the French term for the style “breton brut,” or literally raw concrete. The style, common from the post-WWII period until the 1970s, is usually marked by rough concrete or stone exteriors with protruding sections that underscore the functionality of the interior spaces over the aesthetics of the facade. A 2008 story on NPR highlighted the love/hate people have for the brutal style and discussed the move toward designating many structures, to the dismay of the occupants, as historic landmarks. Boston’s City Hall, which has a strong resemblance to the U of M’s health sciences complex, is one such building on its way to receive a landmark designation. See also Brutalist Architecture on Flickr. As many of us spend our evenings watching the Olympic Games in China we have the opportunity to learn more about the country and people who are hosting this year’s games. Television, radio, newspaper and Internet news stories communicate the hardships and advances taking place in one of the world’s most fascinating places. Twenty-nine years ago, a delegation from the University of Minnesota had the opportunity to learn more about China first hand. Sent by the University administration in support of the recently adopted mission statement of the Board of Regents that cast the U of M as “an institution of worldwide responsibility.” The delegation consisted of twelve members including representatives of the College of Liberal Arts, the Institute of Technology, U of M administration, and two from the Medical School: Dean Neal Gault and Professor Yang Wang. The delegation traveled to various locations during the three week trip in an effort to promote scholarly exchange. In his own report chronicling the trip, Dean Gault recounted in vivid detail his impressions and thoughts on the hospitality of the officials who welcomed them as well as an account of the infrastructure and institutional challenges China faced as it emerged from the Cultural Revolution. In one account in particular, Dean Gault captured both the enthusiasm of their hosts as well as the sentiment of friendship when visiting Jilin University. Smiles, smile, smiles—a[n] ocean full of smiles. Never have I had such a surging within me to imbibe the exhilarating fellowship that was being extended to me; it was a powerful and moving experience that I trust I will never forget. Of course I know such a welcome is extended most visitors and although I think they were so pleased to have the University of Minnesota there I suspect others who come will get the same first class treatment. For the Chinese are very hospitable people who are very kind and gracious. Dean Gault’s praise and excitement came from a man whose own experiences at Seoul National University and the Okinawa General Hospital made him quite qualified to make such an assessment. 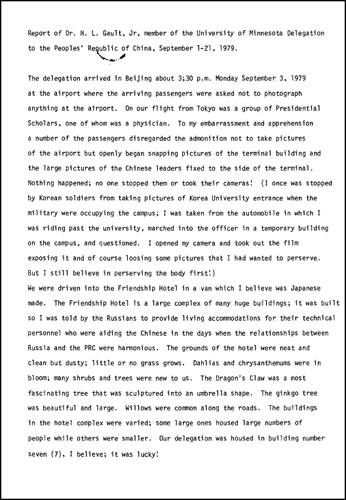 Read the full text of Dean Gault’s Report of the University of Minnesota Delegation to the Peoples’ Republic of China, September 1-21, 1979 below. Page ten is missing from the report copy. The AHC and its health science programs are commonly thought to focus on the health of the individual and larger populations. However, one program focuses on serving the individual and their families long after traditional forms of health care are no longer applicable. The Mortuary Science Program educates students in behavioral and applied sciences in order to provide a service to grieving families and individuals planning for end of life decisions. Uniquely housed within the University’s Medical School the Mortuary Science Program traces its origins back to the School of Embalming in 1908 and is marking its 100th anniversary this year. From 1908 until 1927 the School of Embalming provided vocational training. During the 1930s the program changed to require a high school diploma and at least one year of college to receive state licensing through an expanded 36 week course overseen by the General Extension Division. In the 1950s the University offered the first associate degree in mortuary science and by 1968 the University offered a Bachelor of Science degree and transferred the administrative authority from Extension to the College of Medical Sciences. 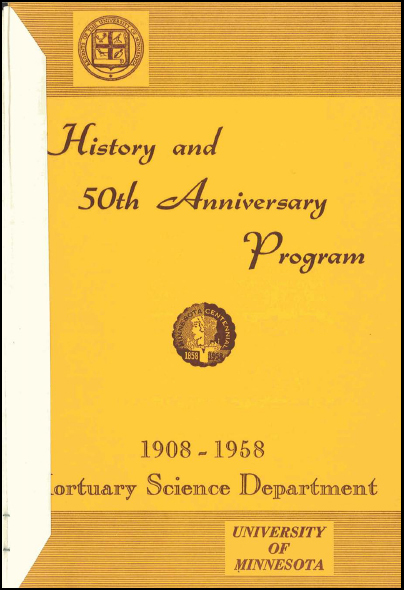 The commemorative pamphlet below is from the Program’s 50th anniversary in 1958.